Ameren Missouri continues to keep a close eye on the weather predicted for this weekend, working with our partners at Quantum Weather, and other agencies, to prepare for freezing rain, wind and ice. At this time, we are told it is fairly certain that whatever this event becomes, it will occur over central Missouri and likely expand across much of the Ameren Missouri service territory. What is still not clear is exactly what kind of precipitation we could be looking at, nor how much of it we will get. Most forecasts are including mention of up to 1/4′”-1/2″ of ice accumulations in the watch area now, but that is still preliminary. It only takes about a quarter to a half inch of ice to begin causing problems with power lines and trees, and our crews are preparing to safely expedite the restoration process, if outages occur. You can help prepare by sharing this information with your constituents on your websites and social media. In the event of a power outage, please report the outage immediately! Call us at Ameren Missouri at 1-800-552-7583 immediately. Be sure to include a number where we may reach you for updates. Visit our website, www.amerenmissouri.com, to report an outage, check the status of an outage, check an outage map to view the status of power restoration throughout the state, and sign up for text alerts. Text REG to 40401, to register for text alerts, report an outage, estimated restoration times, and more. Downed wires can be covered in tree debris and hard to see. Stay away from brush and tall grass that could be hiding a downed power wire. Be sure to keep pets away as well. Report downed wires to 1-800-552-7583 immediately, and do not go near the wire. Please keep all pets inside or leashed in the yard so our crews can work safely and efficiently to restore power. Crews often have to walk through backyards to access downed equipment. Ameren Missouri’s system is designed with redundancy – duplicate systems that function in case of an outage. In many cases, we can re-route power to restore customers’ service while we continue to repair affected lines. Prepare your Emergency supply kit: emergency phone numbers, flashlight and fresh batteries, battery-powered radio, bottled water (1 gallon per person, per day, including pets), first aid kit, blankets, non-perishable food. If using a generator, be sure to keep the unit outside the home. Ground fault circuit interrupters (GFCIs) for electrical outlets can help prevent injuries when installed in areas that may be affected by melting snow or ice. You can also purchase portable GFCIs for your emergency supply kit. 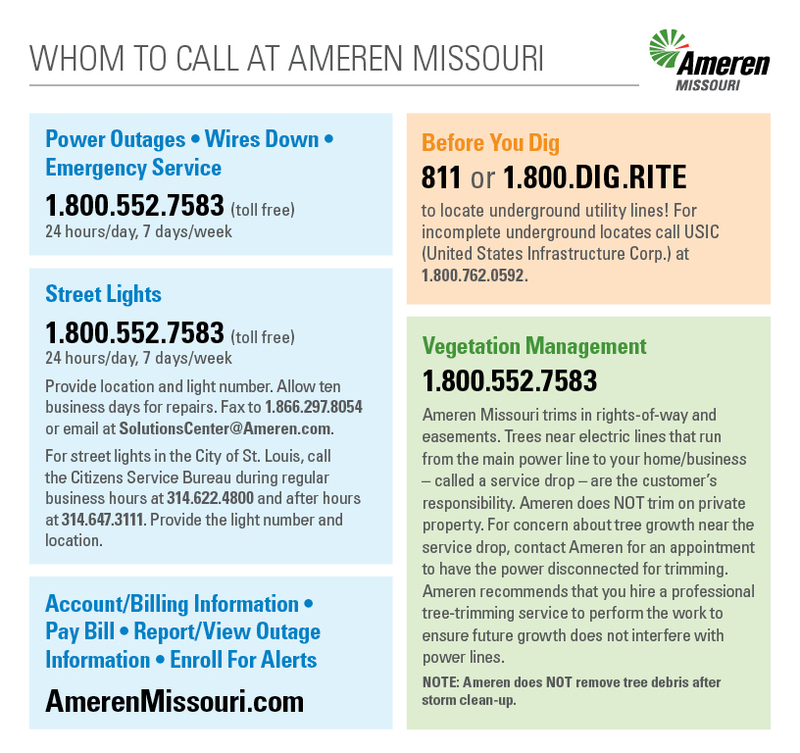 We’ve attached the “Whom To Call” card with contacts at Ameren Missouri – feel free to share this on your website as well. In the event of an outage or downed wire, please call 1-800-552-7583! When you call, ask for the ticket number, and be sure to leave call-back information for updates. If we can be of assistance, please feel free to contact us!